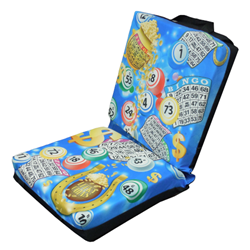 This new bingo pattern features bingo cards and a pot of gold coins. Best news yet, it's full of the Lucky Coins. Each cushion measures 13x13.5x3 inches and includes a carrying handle. Two cushions are fashioned together by a 2.5 inches of patterned fabric.